The assignment of players to the nine handicap classes is given in the Chess Monthly, but the details of what odds were given between what class differences is not spelled out in full. Some of them are made clear, such as that first class gave second odds of Two Moves, while first class gave fourth Pawn and Two Moves. 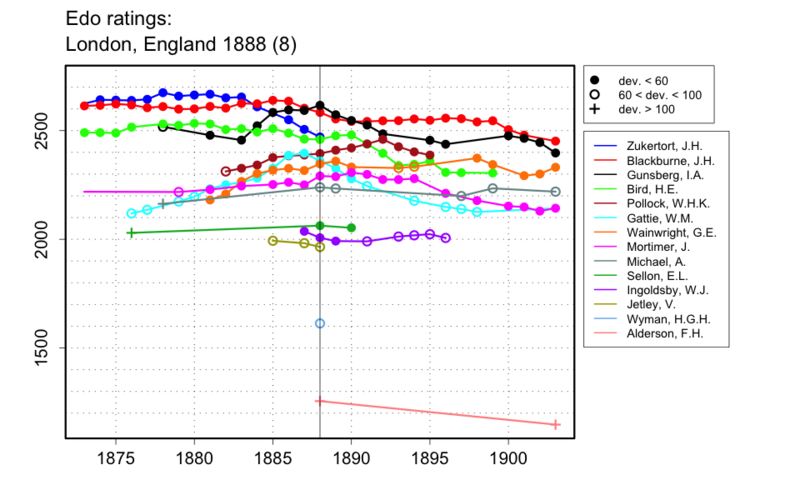 This suggests that the odds were similar to those used in the Simpson's Divan Handicap the same year, which went: Two Moves, Pawn and Move, Pawn and Two Moves, Knight, Knight and Move, and Rook for differences of 1 to 6 classes. This tournament had nine classes, so there were differences of up to eight classes between players. I am guessing that the odds given for class differences of 7 and 8 were Rook and Move, and Rook and Pawn, respectively, though I don't have firm evidence for these. Zukertort died part way through the tournament, and his unplayed games were counted as draws in the official scores, but are not counted here for rating purposes.